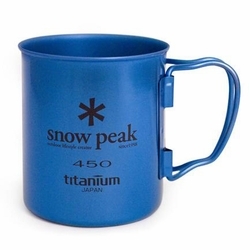 Snow Peak Titanium Single Cup with folding handles holds 14 oz. of liquid and weighs only 2.4 oz. Perfect for backpacking or camping. These mugs are colored with an electric ionization process which bonds to the titanium. The result is a safely coated and vibrant mug. Dimensions: D 3.4" H 3.6"